Three Centuries of American Prints: from the National Gallery of Art, National Gallery of Art, Washington; National Gallery in Prague, Prague 1; Antiguo Colegio de San Ildefonso, Mexico City; Dallas Museum of Art, Dallas, 2016 - 2017, no. 26. McKenney, Thomas, and James Hall. History of the Indian Tribes of North America, vol. 1. Philadelphia, Pennsylvania: E.C. Biddle, 1837. McKenney, James L., and James Hall. The Indian Tribes of North America, with Biographical Sketches and Anecdotes of the Principal Chiefs, vol. 1. Edinburgh: John Grant, 1933, pp. 174-193. 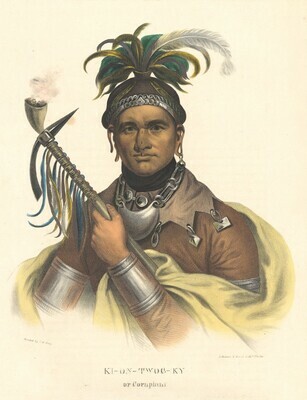 Horan, James D. The McKenney-Hall Portrait Gallery of American Indians. New York: Crown Publishers, 1972, pp. 118-119.